Materials: Remnant of Designer Poly Sheer Fabric, Cotton Velvet, Taffeta, Satin, Jacquard Lumiere and Neopaque Textile Paint Surface Design. 90/10 Feather Down Pillow Inserts. Visual, 18” x 18” approx. 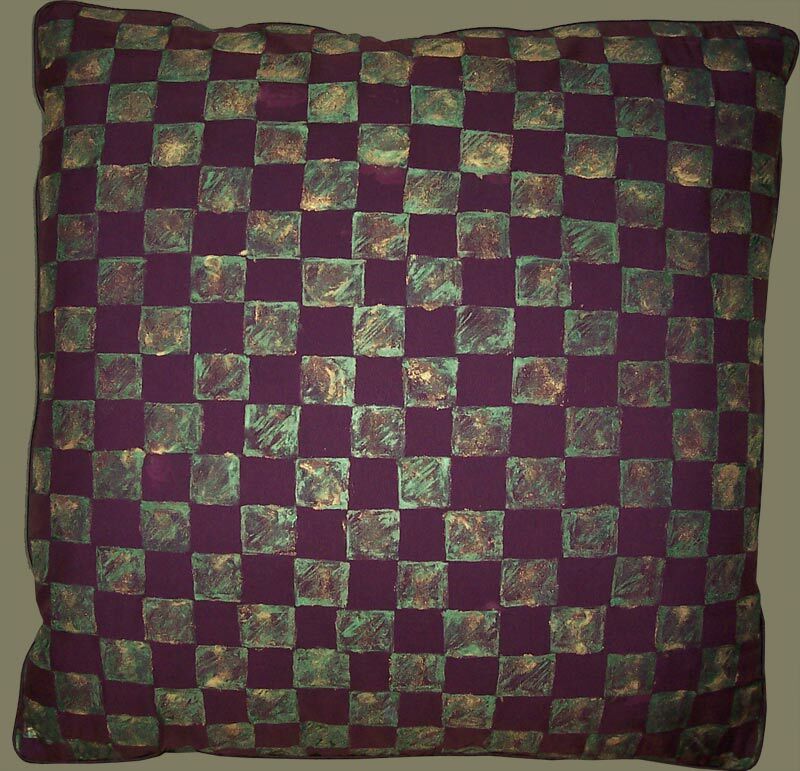 Description: This Contemporary Pillow Design of Checkerboard Squares is Hand Stamped and Painted in Patina Green and Metallic Gold on a Remnant of Eggplant Colored Designer Sheer Fabric. Peeking Through the Eggplant Sheer is Magenta Taffeta Fabric, Sewn as an Underlayment. Light Colored Patina Green Upholstery Weight Cotton Velvet Makes Up the Pillow Back. Mini Welt Detail in Eggplant Colored Satin. These Modern Designer Pillows Have High End Hand Stitched Closures with Feather Down Pillow Inserts. Original Design by Carol Tate.